We are Open. Just in case you were wondering?!? The roads are slippy so please walk and drive with care but the school will be open as usual. Be safe and wrap up warm. After an early start and breakfast (and some very quick and efficient packing) we left the hotel and made our way over the border and headed to Arras. Here we visited Wellington Quarry, a series of underground tunnels used during the infamous Battle of Arras. It was quite an experience walking through the tunnels that soldiers themselves had created, lived and matched on their way to surprise the Germans in battle. After here we travelled towards the amazing Newfoundland Memorial Park, a memorial dedicated to the Newfoundland regiment who were practically wiped out during one days battle during the Battle of the Somme. Here we walked through the remains of British trenches, No Man’s Land and then onto the German side as well as visiting memorials and a mass grave. This was our last place on a jam-packed tour. Currently we have just arrived at Calais and are waiting to board the Eurotunnel. announced as Anna, Lily, Luke S, Helena and Lauren. A huge well done to all pupils in Key Stage 2 who took part in the Primary Maths Challenge in November and an even bigger well done to those pupils who managed to achieve a bronze, silver or gold certificate – the questions were very tricky! Special commendation goes to Andrew F who got a fantastic score of 21 out of 25 – the best in the school. We look forward to hearing if any of our pupils have made it through the next round in February. For those parents who could not make the parents evening tonight, or if you just wanted to check something you thought you heard quickly, here is the presentation from tonight’s Parents Evening. I hope you found it informative. Interactive Evening… Come On In! We welcome you to come and experience us as a school. This is not an open evening… this is an interactive, get involved, experience us, explore us and begin to love us evening. We do believe we are awesome. We know you will too. We have listened to feedback and this year the route around school begins with the year 5 area. Please follow signs from the car park and front of school to the year 5 doors where someone will be there to greet you with a map and a smile. ALL TIMES STATED BELOW ARE BRITISH TIMES! 10:06am – We woke at 6.15am to set off and are currently around an hour from the train at Calais! 12:00pm – about to board the train!! Blighty here we come! 13:16 – Touchdown!! And so continues the long drive North. I will update the ETA when we have passed London as the traffic will massively effect the time. 17:48 – Pupils are all fed and we are on our way again! 19:28 – Just short of Doncaster where we say goodbye to our wonderful coach driver, Mark. We will pick up a different driver for the remainder of the journey. Very slow traffic however on the A1. 20:12 – we have our new driver, Kevin, and have had our last toilet break. Ovingham here we come! ETA UPDATED! PLEASE DO NOT PARK ALONG THE TENNIS COURT SIDE OF THE CAR PARK AS THE BUS NEEDS TO PARK THERE! Today we set off for our epic tour of “Gai Paris”. A bright and early start was required in preparation for the famous Paris traffic. First on the agenda was the Cite de Sciences (Science Museum) where our pupils explored movie special effects, flew virtual gliders and learned about the science of fire. We then headed for lunch under the Eiffel Tower which provided the pupils with an opportunity to take photos and lounge in the sun. Next on the agenda was a peaceful (until we arrived anyway) cruise along the Seine, on the “Bateaux Parisiens”. 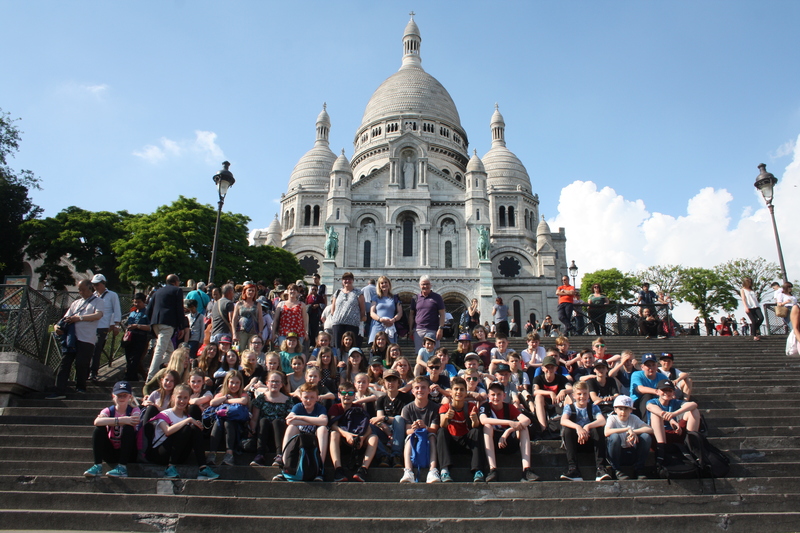 The biggest challenge of the day was the arduous climb up to the mighty Sacre-Coeur to Montmartre. After a brief stop to catch our breath at base camp we continued to the summit in the baking sun. More photos, ice cream and novelty souvenir shops followed before we had to plunge back into the Paris traffic for the long drive home. The pupils were surprised with a bonus experience when a tray of 120 cooked “escargots” (snails!!!) was delivered. Much to the our delight the pupils rose to the challenge and the tray was left empty!!!! Late night and a very start required so photos will have to wait until we are back in good old blighty! Please keep a close eye on the website for our ETA tomorrow. I will be updating the page as we make our way up the A1. The pupils woke this morning with a spring in their step and were super excited for the day ahead. After being handed their Official OMS French Trip Tour T-shirts, they piled downstairs for another hearty breakfast. The journey to the theme park was quick as the traffic was good and “en route” the pupils entertained each other with stories of theme parks around the world. We arrived just as the park opened and after organising into groups based on which rides our pupils wanted to do, we headed into the wonderful world of Astérix. The weather today was perfect for a day at a theme park, warm but not too sunny, and the pupils impressed us all with their willingness to push their boundaries and challenge themselves. The rides were excellent with Zeus, Goudurix and Osiris coming out as clear favourites for the more adventurous and Pegasus, Discobelix, the dolphin show, the Romans vs Gauls extravaganza and the Menhir Express favourites for those feeling less courageous. The pupils were bought a tasty lunch before we hit the park once again. The wonderful day came to an end when the park closed at 5.30pm and the pupils returned to the campus a-buzz with stories of how scared they had been and which ride they liked most. Dinner was followed by an evening out on the sports field expending the last of their almost inexhaustible energy. The day started bright and early followed by a healthy, continental breakfast. After filling up on croissants, cereal and orange juice, we piled onto the coach to set off for the authentic French market, Brie- Comte-Robert. The market, located near a partially ruined fortification, gave our pupils their first chance to use their improving French as well as their first chance to spend their parents’ hard-earned cash. Pupils bought presents, hats, food and the obligatory plastic Eiffel Towers! The next item on the agenda was the beautiful medieval town of Provins where we walked around looking at the ramparts, battlements and Gothic and Romanesque architecture. To help cool down, we descended en-masse to a very small ice-cream parlour to buy “des glaces”. Before leaving Provins, we sat down to watch a fantastic medieval spectacular, featuring jousting knights on horses, sword fights and orcs. Finally, we stopped by a supermarket to stock up on sweets and drinks before heading back to the campus for a tasty dinner and evening games. Anyone who was lucky enough to get tickets for the Bugsy Malone show would definitely agree.